Coral Julia Dumna hotel is situated in the heart of Aleppo, one of the oldest inhabited cities in the world. Conveniently located 15 minutes away from Aleppo Airport, the hotel is ideal for both business travellers and tourists. Proximity to popular shopping and entertainment areas set the stage for a great day. 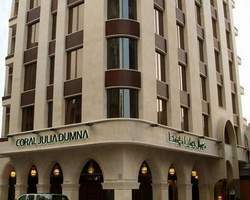 The Coral Julia Dumna Hotel is a landmark by itself and is surrounded by the most famous historical sites in Syria. Coral Julia Dumna Hotel is 10 minutes walk from Aleppo Citadel and 150 meters from the Grand Mosque and Medina Bazaar. Not very far from the hotel are the National Museum, Public Park, Museum of Popular Arts and Traditions and popular Bazaars, Khans &Hammams. Coral Julia Dumna, Aleppo offers 46 well-appointed guestrooms and 8 luxurious suites ornamented with fascinating Arabesque Art – depicting the city’s glorious heritage and traditions – along with the up-to-date technology and facilities. All Coral Julia Dumna Hotel rooms have been designed with your comfort in mind. truly unforgettable experience awaits you at Coral Julia Dumna, Aleppo from the distinctive service to the irresistible restaurants. Marvellous view, luxurious décor, stunning ambience and exquisite Mediterranean, oriental and international menus make Al Zaitona the ultimate destination for gastronomes. The restaurant serves Breakfast Buffet and a la carte lunch and dinner. Coral Julia Dumna Hotel dazzling terrace with the panoramic view of Aleppo Citadel is the place where you can enjoy the most spectacular moments of your summer nights with its delicious food and tasty narjile. Calm meeting area for everyone, featuring a variety of beverages and fresh pastries. Offering free Wi-Fi Internet access and world-wide collection of magazines and newspapers. Operating 24 hours with oriental and international selections of food and beverages. Coral Julia Dumna, Aleppo offers sophisticated corporate equipment and facilities perfect for any meetings. Coral Julia Dumna Hotel conference room offers the latest technology, LCD screens, laptop, printer, fax and all other business facilities. Coral Julia Dumna take care of your every need throughout your stay with a service that is unmistakably Coral’s signature. Coral Julia Dumna concierge team is remarkably knowledgeable and up-to-date about the happenings in the city and its beautiful features. From ideas for days out to event bookings, you can rely on Coral Julia Dumna Hotel concierge to look after you from the moment you arrive.